Monsieur Grandet thus obtained that modern title of nobility which our mania for equality can never rub out. He became the most imposing personage in the arrondissement. He worked a hundred acres of vineyard, which in fruitful years yielded seven or eight hundred hogsheads of wine. He owned thirteen farms, an old abbey, whose windows and arches he had walled up for the sake of economy -- a measure which preserved them -- also a hundred and twenty-seven acres of meadow-land, where three thousand poplars, planted in 1793, grew and flourished; and finally, the house in which he lived. Such was his visible estate; as to his other property, only two persons could give even a vague guess at its value: one was Monsieur Cruchot, a notary employed in the usurious investments of Monsieur Grandet; the other was Monsieur des Grassins, the richest banker in Saumur, in whose profits Grandet had a certain covenanted and secret share. Although old Cruchot and Monsieur des Grassins were both gifted with the deep discretion which wealth and trust beget in the provinces, they publicly testified so much respect to Monsieur Grandet that observers estimated the amount of his property by the obsequious attention which they bestowed upon him. In all Saumur there was no one not persuaded that Monsieur Grandet had a private treasure, some hiding-place full of louis, where he nightly took ineffable delight in gazing upon great masses of gold. Avaricious people gathered proof of this when they looked at the eyes of the good man, to which the yellow metal seemed to have conveyed its tints. The glance of a man accustomed to draw enormous interest from his capital acquires, like that of the libertine, the gambler, or the sycophant, certain indefinable habits -- furtive, eager, mysterious movements, which never escape the notice of his co-religionists. This secret language is in a certain way the freemasonry of the passions. Monsieur Grandet inspired the respectful esteem due to one who owed no man anything, who, skillful cooper and experienced wine-grower that he was, guessed with the precision of an astronomer whether he ought to manufacture a thousand puncheons for his vintage, or only five hundred, who never failed in any speculation, and always had casks for sale when casks were worth more than the commodity that filled them, who could store his whole vintage in his cellars and bide his time to put the puncheons on the market at two hundred francs, when the little proprietors had been forced to sell theirs for five louis. His famous vintage of 1811, judiciously stored and slowly disposed of, brought him in more than two hundred and forty thousand francs. If some Parisian mentioned Rothschild or Monsieur Lafitte, the people of Saumur asked if he were as rich as Monsieur Grandet. When the Parisian, with a smile, tossed them a disdainful affirmative, they looked at each other and shook their heads with an incredulous air. So large a fortune covered with a golden mantle all the actions of this man. If in early days some peculiarities of his life gave occasion for laughter or ridicule, laughter and ridicule had long since died away. His least important actions had the authority of results repeatedly shown. His speech, his clothing, his gestures, the blinking of his eyes, were law to the country-side, where every one, after studying him as a naturalist studies the result of instinct in the lower animals, had come to understand the deep mute wisdom of his slightest actions. "It will be a hard winter," said one; "Père Grandet has put on his fur gloves." "Père Grandet is buying quantities of staves; there will be plenty of wine this year." 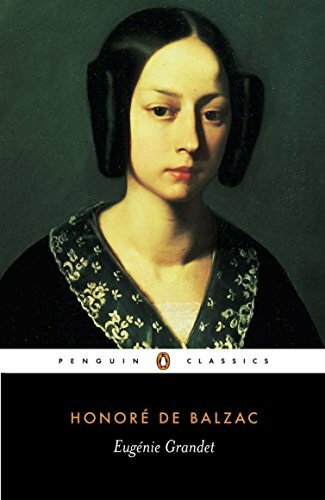 This is one of Balzac's most celebrated novels, which I had come across before, along with Le Père Goriot, in a French literature course. I am still early on in the "Scènes de la vie de province" portion of La Comédie Humaine, but this book managed to rival Ursule Mirouet, which comes directly before it, in my admiration. Balzac chose the title of his collection by analogy to Dante's Divine Comedy, in the sense that all of the sins and vices of humankind are revealed to the reader not on the stage of a visionary afterlife, but right here in our own world. The vice on display in Eugénie Grandet is avarice, which governs every action of Eugénie's father, to the point that it almost makes him destroy his own daughter. He reminds me in many ways of a family friend I grew up with in provincial Michigan, who in spite of being rather wealthy would keep his house so cold in the winter that we had to sleep in hats and scarves there.